We care for children who have rheumatic conditions, inflammatory diseases and autoinflammatory diseases. Many of the conditions we treat involve joint swelling or joint pain. At Children's, our team of trained pediatric rheumatologists is involved in the diagnosis, treatment and follow-up care of children and teens with a wide range of rheumatic diseases. 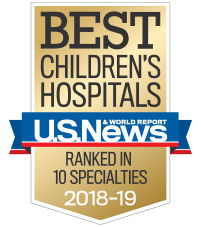 Children's is home to one of only a handful of pediatric rheumatology centers in Georgia. Combining the latest proven technology and research with a caring, child-friendly approach, makes Children's a top choice for children and teens with rheumatic and primary immune deficiency diseases. We are one of only two pediatric rheumatology centers in Georgia, and we see patients from almost every county in our state. Each year, we care for more than 2,000 children and teenagers, from birth to age 21, which amounts to more than 7,000 visits a year. Three of our physicians perform musculoskeletal ultrasounds and ultrasound-guided steroid joint injections. We are actively engaged in research and quality improvement. Our division director, Sampath Prahalad, M.D., has been on the list of Atlanta Magazine Top Doctors for multiple years in a row. Download "Five things you need to know before your child's appointment"
Download "Important tips for parents"
While keeping appointments is important for your child's treatment, we understand other obligations may arise. If you are unable to make your child's appointment, cancel the appointment as soon as possible. When you don't cancel appointments, you prevent other children from being seen and receiving important care and treatment. We appreciate your help and understanding. Download "Three easy ways to cancel your child's appointment"